The attached article from the January 19, 1908 Indianapolis Star discusses the state of American racing cars as opposed to those found in Europe. A central theme are the rules used on both sides of the Atlantic. Differing rules packages were the core issue between the Automobile Club of America (ACA) and the American Automobile Association (AAA) in 1908 and nearly caused the cancellation of the Vanderbilt Cup for the second year in a row. Differing rules packages was the core issue between the Automobile Club of America (ACA) and the American Automobile Association (AAA) in 1908 and nearly caused the cancellation of the Vanderbilt Cup for the second year in a row. I file this item (Indianapolis Star, September 27, 1908) under "Grand Prize" because it is most pertient to the Automobile Club of America's (ACA) role in the early days of the sport. 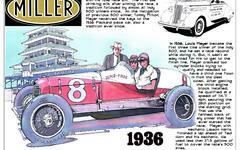 This is a collection of articles about the 1908 American Grand Prize from the Indianapolis Star (See articles on the preparation for this race elsewhere on First Super Speedway.) The race was part of a larger event that included a voiturrette race for light cars. A November 1, 1908 article (attachment Savannah110108) announces that 17 of the small cars were entered. The article in attachment GrandPrize111409 was originally published in the November 14, 1909 Indianapolis Star. It focuses on the prospects of staging the American Grand Prize, now called by some the original United States Grand Prix, in 1910 after the event went into hiatus in 1909 after its inaugural running in 1908. The attachments below contain articles about the revival of the American Grand Prize. The first article (attachment GrandPrize021310) was originally published in the February 13, 1910, Indianapolis Star. It concerns plans to revive the race - the forerunner to the United States Grand Prix - after a year hiatus. This article was originally published in the February 27, 1910 Indianapolis Star. It concerns the effort the Savannah, Georgia's community leadership made to attract the American Grand Prize to their city for the upcoming racing season. This article was published in the April 17, 1910 in the Indianapolis Star. The attached article appeared in the May 1, 1910 Indianapolis Star and is a follow-up to an April 17 article announcing the date of the 1910 American Grand Prize.